In a DRIP, any income/distributions provided by your investments are reinvested into the issuing investment to create greater future earnings. While the profits might not amount to much in the short-term, in the long run you will see your investment grow exponentially due the cumulative reinvestments and the effects of compounding growth. Apart from these individual plans, many brokerage firms also offer their own consolidated DRIPs where all dividend payouts can be automatically reinvested through a single account. In this case, your broker will purchase the additional stock through secondary markets such as the NYSE or NASDAQ. Most casual investors prefer this approach as it saves them the hassle of monitoring different accounts to track where their reinvestment funds are going. As with any compound profits, the benefits of dividend reinvestments really become apparent over the long-term. By automatically purchasing more shares, you increase your capital base and thus the amount of gains you will recognize if you ever decide to sell your stock (assuming share prices grow consistently). You will also be entitled to additional earnings on each share which will grow your year-on-year income. While there’s certainly nothing wrong with taking immediate returns over future rewards, you should consider your current liquidity requirements before setting up a DRIP. If you’re likely to need your dividend income in the near future, then you might set up a system where your broker reinvests dividends into short-term money markets that offer relatively little yield but easy withdrawal. If you’re investing for the long-term then you may be better served reinvesting into the issuing company or mutual fund. Most companies benefit from dividend reinvestments because these are usually long-term investments. For this reason individual DRIPs are often administered free of cost with no enrollment costs or third-party transaction fees. Many companies now run their DRIPs through tax-sheltered investment accounts that protect shareholders from the effects of double taxation on their dividend reinvestments. This helps to optimize the compounding effect. Many brokerages also administer DRIPs at no additional cost. Even when you’re dealing with blue-chip stocks, share prices will be subject to fair amount of fluctuation over the course of the year. 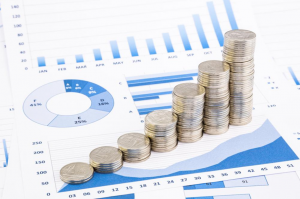 By reinvesting dividends on a bi-annual or quarterly basis you can minimize the cost of purchasing stocks at their highest price, as you acquire shares on a continuous basis, i.e. dollar cost averaging. If you’re investing in individual DRIPs, then you need to be extremely diligent about your transaction records. Even though you aren’t receiving any actual cash in hand you will still need to report the dividend amount on your 1099-DIV form. You will also need to keep track of the amounts you have reinvested because any capital gains you realize on the sale of shares will be taxed on the original shares plus the reinvested dividends. Investment Account Manager excels in tracking DRIPs, maintaining cost basis information and allowing users to monitor the power of compounding.